Temperature display range: 0 鈩?-50 鈩? 2 Aaa batteries The projector Screen will disappear after a few seconds, If you want to see the time and then click on the top of the "Light" Button. Dc 4.5V Input Ac transformer power supply, The projection and the Screen is always bright (No close function), You can see led back light and projection all the time. The alarm needs to be reset the time after power outage. 180-Degree swivel projection alarm clock:Project time onto your walls or ceiling so that you just need open your eyes to read time. 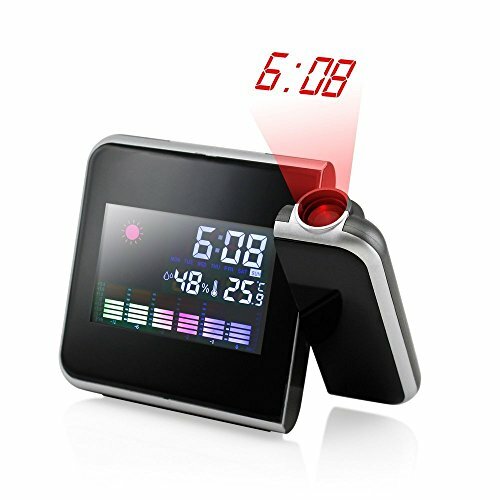 Back light alarm Clock: When Clock is powered by batteries, Clock'S back light and projection only stays on 8 Seconds by pressing the snz/Light button. When it is powered by external power, Clock'S back light and projection will always stay on. How to charge: This digital alarm clock powered by usb (Included) Or 2 Aaa battery (Not Included). View More In Projection Clocks. If you have any questions about this product by lovehouse, contact us by completing and submitting the form below. If you are looking for a specif part number, please include it with your message.